The Town of Jackson, the county seat of Teton County, Wyoming, is located in the northwestern part of the state, about 15 miles from the Idaho border. Jackson Hole is best known as the gateway to excellent Wyoming skiing and to Grand Tetons National Park, located just north of the Town. The Town of Jackson, around 9,500 residents, is the heart of Jackson Hole and is known for its widely recognized Town Square Park framed by elk antler arches at each corner. See a live web-cam of the the Jackson Town Square. Jackson offers a good selection of unique retailers, particularly antique stores, stores specializing in Indian arts and crafts, and sporting goods purveyors. Among the highlights are Boyers Indian Arts, Hoback Sports and Valley Bookstore, an independent bookseller in business for more than 45 years. Downtown shopping revolves around Town Square, a scenic, western-themed block of art galleries, restaurants, gift shops and antique stores. Owners of Jackson, Wyoming real estate need never go hungry. The town boasts an amazing array of eateries. Some of the more popular, locally-owned establishments include the Snake River Brewery and Restaurant for American fare and house-brewed beers; the Mangy Moose for fine dining in an historic, Victorian setting; and the Cadillac Grill for innovative cuisine using local game and produce in a fun and lively atmosphere. One of the best things about Jackson Wyoming real estate is the abundance of nearby outdoor recreation. From skiing to snowboarding to fishing to hiking, this area offers a plethora of year-round activities. Jackson is within a short drive of three ski resorts: Jackson Hole Mountain Resort, Grand Targhee Ski Resort and Snow King Resort, the first Wyoming ski resort. In addition, the town is just 12 miles away from the 310,000-acre Grand Teton National Park and the hiking, camping, boating, fishing and cross-country skiing opportunities found there. Yellowstone National Park is just an hour's drive away. For fishing enthusiasts, the Snake River, which flows just west of Jackson, offers some of the best fly fishing in the United States. Golf fans will find plenty of courses to test their skill, including the public, 18-hole course at Teton Pines Golf Club. Many courses in this area offer dramatic views of the Teton Mountains. Jackson, Wyoming real estate ranges from relatively modest condos and townhouses for under $500,000 to lavish, multi-million-dollar estates. Because more than 90 percent of Jackson, Wyoming real estate is owned by the federal government, the available private properties tend to hold their value. 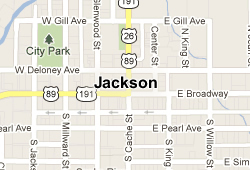 The average home sales price in Jackson in 2011 was $601,800. The properties in Jackson are noted for their large acreage and dramatic mountain and prairie views. Some lots even offer fly fishing in the many creeks and streams that criss-cross this area. This is also horse country and many properties include barns and stables. Children of Jackson, Wyoming’s real estate owners attend the schools of the Teton County School District. The district has an enrollment of around 2,300 students and its facilities include six elementary schools, one middle school and two high schools. The district is justifiably proud of its nearly 93% graduation rate. Jackson is also home to Jackson Hole Community School, a private, college preparatory school, and a branch of the University of Wyoming. St. John's Medical Center, established in 1916, is the primary health care provider in the Jackson area. The facility offers a variety of inpatient, outpatient, wellness and specialty care along with an emergency room and birthing center. There are also several outpatient and urgent care clinics located around the city. Jackson is easy to navigate by car and is connected to other parts of Wyoming by SR 89, which bisects the city. In addition, Southern Teton Area Rapid Transit (START) provides public transportation between points in the city and downtown Jackson and between Jackson and nearby Teton Village, Star Valley and Teton Valley. The ski resorts also offer transportation between themselves and downtown Jackson. For longer journeys, Jackson Hole Airport is just a short drive north of the city. The 533-acre airport, located within Grand Teton National Park, offers non-stop service to Dallas, Chicago, Atlanta, Salt Lake City, Houston and Denver.